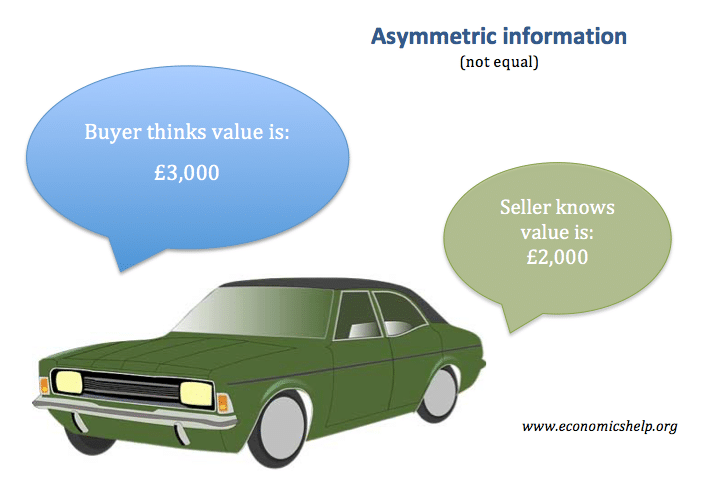 Definition of asymmetric information: This is a situation where there is imperfect knowledge. In particular, it occurs where one party has different information to another. A good example is when selling a car, the owner is likely to have full knowledge about its service history and likelihood to break-down. The potential buyer, by contrast, will be in the dark and he may not be able to trust the car salesman. Asymmetric information can lead to adverse selection, incomplete markets and is a type of market failure. When looking at a car, a buyer can only see the externals and not see under the bonnet. Asymmetric information is a problem in financial markets such as borrowing and lending. In these markets, the borrower has much better information about his financial state than the lender. The lender has difficulty knowing whether it is likely the borrower will default. To some extent, the lender will try to overcome this by looking at past credit history and evidence of reliable salary. However, this only gives a limited information. The consequence is that lenders will charge higher rates to compensate for the risk. If there was perfect information, banks wouldn’t need to charge this risk premium. Another example of asymmetric information is about insurance. When insuring a good, the insurer is uncertain how well the customer will look after a piece of property. For example, if a consumer was careless with locking his bike, the insurer would not want to insure it. This problem can lead to the related problem of adverse selection. When employing a worker, a firm doesn’t know how hard the worker will work. The employer can look at his CV and past references, but once employed he cannot guarantee the attitude of the worker. Managers of companies may have inside knowledge about the fortunes of the company. With this knowledge, they may know the share of the company is either over-valued or under-valued – compared to market price. This is why ‘insider-trading’ is illegal as managers could use their greater knowledge to make a profit out of unknowing share traders. George Akerlof was awarded the Nobel Prize in economics (2001) for his 1970 paper “The Market for Lemons,” This groundbreaking work used the second-hand car market to investigate this problem of asymmetric information between buyers and sellers. Akerlof noted it could lead to adverse selection – with the price of second-hand cars being below the equilibrium because there is an incentive to sell ‘lemons’ (dud cars) and therefore people hold back the ‘peaches’ good cars. Asymmetric information can also be analysed with game theory. For example, when deciding whether to cut or increase prices, firms will be uncertain about how their rivals will behave and react. They will have to make decisions while trying to second guess how other second-hand will respond. Invest in the business – give signals. WIth second-hand car markets. If you were buying from a one-off private buyer, you would have reasons to be suspicious about the quality of the car. However, if a second-hand car dealer invests in large property and advertising, it is a signal that the firm intends to stay in the long-term. In this case, the firm has a greater incentive to sell reliable cars and avoid costs to its reputation. Give warranties. Another way to avoid asymmetric information is for second-hand car salesmen to give warranties for the reliability of their car. Employ a mechanic to test car. If you are going to buy a second-hand car for £7,000, it would be worth paying £100 to a qualified mechanic to run the car through independent tests. This would give you more information. Also, the car dealer would be wary of trying to sell ‘duds’ if you were bringing a qualified mechanic to test. No claims bonuses. To overcome asymmetric information in insurance, insurers will give big discounts for ‘no claims bonuses’ this is the best way of gaining better information about ‘careful’ and ‘unlucky’ consumers. The end of Asymmetric information? Some economists argue that the internet has helped to reduce the incidence of asymmetric information. For example, when guests go to visit hotels and restaurants – they can look at online reviews to have a better idea what to expect. Selling second hand goods through market places like Ebay relies on sellers building up good reviews. Therefore, there is an incentive to only sell goods which are correctly marketed.